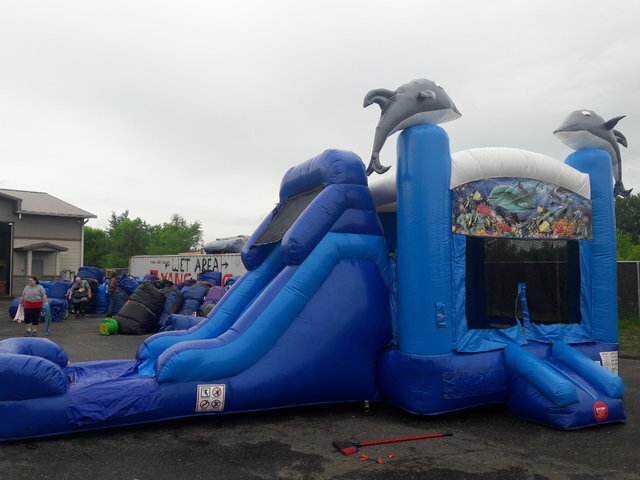 The Dolphin Single Lane Bounce House Wet or Dry Slide Combo is an inflatable bounce house with a single lane slide attached. Two cute and friendly dolphins greet party goers or patrons from the top of the bounce house. A colorful under sea picture hangs above the entrance adding to the theme of the inflatable. Enter the safety enclosed bouncy house and jump, bounce or try to make a basket through the enclosed hoop, then climb the rock wall up to the giant single lane slide. For even more fun on a hot day, attach a hose to the slide for a wet water slide that ends in the splash down pool at the bottom. 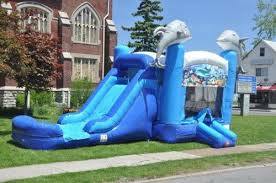 Make your next backyard celebration a big tropical hit with the Dolphin Single Lane Bounce House Wet or Dry Slide Combo. It's tons of fun for kids and adults alike! Perfect for events and parties with underwater and aquatic themes.